Founding and Managing Partner of Law Offices of Mindin & Mindin, P.C. where we handle a variety of different cases ranging from Personal Injury, Landlord/Tenant, Consumer Debt Defense and Criminal Defense. Leon Mindin does not have any reviews yet. 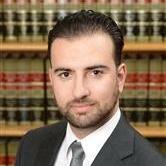 Founding and Managing Partner of Law Offices of Mindin & Mindin, P.C. where we handle Personal Injury, Landlord/Tenant, Consumer Debt Defense and Criminal Defense.